Cobourg’s history as a “life-saving” port goes back many years. It had the first such station on the Great Lakes. The station was established on November 7, 1872, with Dan Rooney Sr. as coxswain, in charge of its boat and crew. This was the forerunner of today’s coast guard system. Captain Slade briefs visitors on the role of the Search and Rescue operation in the Cobourg region. 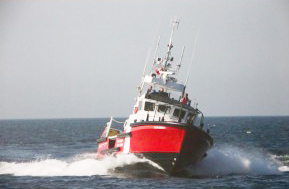 Today’s Canadian Coast Guard was officially created in 1962. 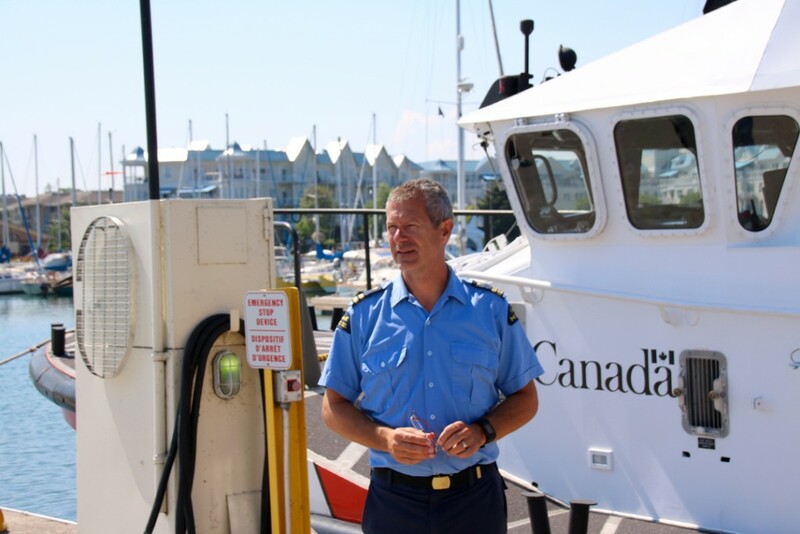 Captain Colin Slade, currently in command of the local unit, tells us that their mission is “to rescue anyone in distress” within reach of their vessel. This ranges from a sinking or grounded vessel to one endangered by fire. Cape Mercy moored at Coast Guard Station in Cobourg harbour. 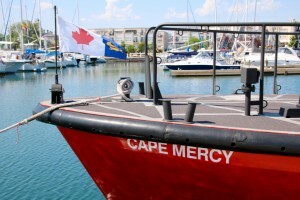 The Cape Mercy, the current vessel stationed in Cobourg harbour, was built in 2000 in Kingston, Ontario. The 47 foot long ship is a search and rescue vessel named after Cape Mercy, located on the southern end of Baffin Island on the Cumberland Peninsula. The cape was named by explorer John Davis who sailed through it in 1585 and called it “Cape of God’s Mercy”. The Cape Mercy can sail 25 knots at full-ahead It is like a sports car out on the water. But “its engines are also more environmentally friendly than the previous ship,” notes Captain Slade. The Cape Mercy on patrol out of Cobourg. The ship provides the local Coast Guard with search and rescue capabilities between April and December and in all weather conditions.